It seems to only be when you change between windows in the Unity Editor. If you stay in one window, it's able to run smoothly. Are there any solutions out there to this? It's as close to blocking as a blocker can be. It may also be related to the latest Windows 10 update, since I received both between sessions of Unity work. But, if I stop OVR Runtime Service, it works like a dream. Moving to Unity dev forum. Same is happening for me. Have tried with multiple projects in various versions of Unity (5.6.3f1 and 5.6.1p1) and the same result of a few seconds pause when clicking from one Unity Editor view to another. For example after manipulating something in the Scene view, if I click on the Inspector view there will be a few seconds pause before Unity responds. If you look in the Windows Task Manager you can see the Unity process become "Not Responding" just before it recovers. Uninstall the Oculus software fixes the problem but make Oculus development a little tricky. Current have Oculus app version 1.17.0.424527 (1.17.0.424315) installed. Not that this absolves Oculus Tech Support in any way, I think this may be Windows 10 Creators Update related. I got both at the same time, and other people at my studio are not experiencing the same issues with 1.17, but also haven't received the Windows update, yet. I hope a fix for this is coming soon. Posted on reddit regarding this, carlsagan79 requested some info to troubleshoot, no word since. Temporary workaround is to disable oculus runtime in Services, and edit in Unity. To playback in unity, enable in services, wait couple mins, open oculus desktop + play. Not great timewise, but works till hopefully patched by oculus. Got the same issue, coincided with updating to the Oculus 1.17 update. Stopping OVRService is a temp fix for now. Experiencing this same problem. Is there any fix other than stopping and starting the OVRService continiously? Here is another (Unity) thread talking about it. I can't do any VR development at home. Is there a way to rollback the runtime version? What USB controllers are people using? I bought this new (Inateck/FrescoLogic) USB card because Oculus doesn't support the (Etron) USB controllers on my (Gigabyte) motherboard. The new card has worked fine for the past 6 months, until this update. Anyone else using the same card or FL1100 series? As posted above, this is an active issue that is being internally triaged at this time and a fix will be announced when this process has finished. Of course, I appreciate that. I just wanted to know if anyone had perhaps found a 'hacky' workaround, instead of having to stop/start the OVRService continuously (pretty impractical for development). Thanks, that's saved me the bother of reinstalling everything - I'm so desperate I almost nuked my OS and started from scratch. Interesting that your work PC is fine.. Any ideas what might be different between your home and work PC? Windows 10, using Oculus 1.17, Unity 2017.1, SteamVR SDK. I'd also like to know if there's a way to rollback. Appreciate this isn't the solution Oculus want, but it's the solution we need right now to continue development. Not experts by any means, but seems to point towards USB issues. Hopefully this is of some help. Edit: We've tried it with a blank project, without enabling VR, and we get the same issues... iirc you can start a blank project and Unity will enable VR SDKs automatically if it detects a HMD.. so perhaps since the oculus version change, something broke with this "detection"..? I'm actually pretty intrigued now! I was noticing just yesterday that I started to have weird sensor failures/errors/undetected notices for one of my sensors (it changed which one would have the issue every hour or so, and they seem to be working decently today, so it wasn't the sensors). I think that this theory holds water, for sure. It couldn't be a power-draw thing, could it? I've noticed my monitors also flicker and I get that Windows "a device was connected/disconnected" sound. That might explain USB drops and device-detection issues. Yeah I'm starting to really think it's USB related. I was also getting random disconnected/connected sounds. All 3 USBs are plugged into the FL1100, but I might try switching some around tonight to see if that makes a difference. I have onboard USB3.0 but it's not a recommended chipset, of course..
Yeah, replugging the sensors fixes that right up, but doesn't cure the Unity slowdown at all. I have been running the service about 7 hours now, and haven't seen the sensor issues today. Still got the slowdown though. My office has dubbed this "The Oculus Plague," and people are desperately fighting to prevent Oculus and Windows 10 from updating as much as possible, since 3 of us have caught it! I'm also on that same USB3.0 hub (FL). Yes, it is indeed USB related. Specifically, certain USB devices are far slower to enumerate than they should be. Normally this is a minor annoyance, and one that we're looking into fixing. But for some reason, with the 1.17 runtime update installed, we're getting Windows messages to re-enumerate USB devices whenever you click around from panel to panel in the Unity editor UI. This happens whether you have a headset plugged in or not, and with all recent versions of Unity whether you're working on a VR enabled project or not. @hoesing Many many thanks for looking into this and thanks for the update. In your other post you mention tracking down the device - In my case it just so happens that the offending device is also the HMD, which I found via a process of elimination. If you need any more information about my system specifics to help narrow down the problem I'm happy to provide that. As you mention, we weren't seeing this issue with the 1.16 runtime so I reiterate my request to Oculus to allow at least developers to downgrade to previous versions of the runtime. My problem seems to have been resolved by updating the drivers for the Inateck USB 3.0 pcie card that I have installed in my machine. 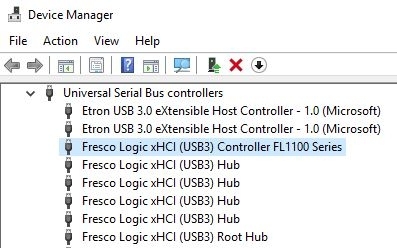 It uses a Fresco Logic FL1100 Series controller apparently. I grabbed the 3.8.33709.0 version drivers from the Inateck website and Unity is now working. This worked for me, too. Thanks for the fix! New USB drivers didn't work for me either. If I stop Oculus service or unplug Rift, all is fine. Enable Oculus service or plug Rift back in and the problem comes back every time. Been waiting patiently for a fix. Patience just about gone... If only they'd let us go back to the previous version of Oculus Home while they figure it out. Disallowing roll-back seems a bit like hubris to me. If only they'd let us go back to the previous version of Oculus Home while they figure it out. Disallowing roll-back seems a bit like hubris to me. My Inateck card was using the 3.5.106 version drivers before I upgraded them to 3.8.33709.0 version. @hoesing mentioning USB made look for more recent drivers. No clue why the newer versions work for me but not others. Those particular drivers are giving me some stutter in-device now, though. They don't seem to run as smoothly as the older ones did. I just can't win, lol. Yeah, I definitely spoke too soon. Now I get slow-down and flashy-screen in-device, and after running anything once, Unity starts to slow back down. 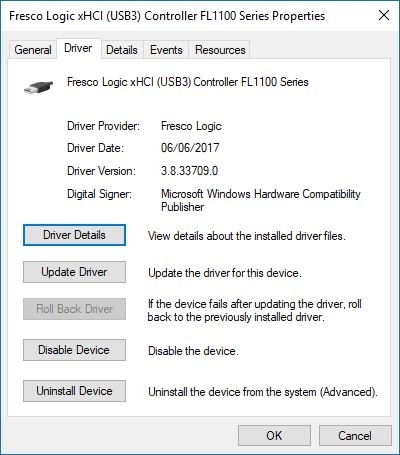 I had to install the 3.8.33709.0 drivers twice as the first time it seemed to uninstall the old versions but not install the new versions, leaving the card using Microsoft drivers. These only do USB 2 speeds. I noticed when the Oculus app was complaining about the USB speed. Running the driver installer again fix that. Hopefully the Unity freezing does not return for me. After turning my computer back on, Unity has started to freeze for a few seconds when changing Editor views again. Checking these threads both on here and Unity yet again to see no official word on a fix or a rollback. It's getting pretty frustrating now, and brought our development to almost a halt. Give us a rollback to 1.16, please. Do we know if they're even working on it? Maybe not enough of us are affected to matter.